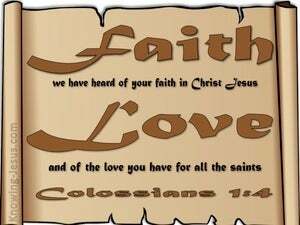 Having heard of their fervent trust in the Lord Jesus Christ and their love for one another, we read that Paul prayed often for the Colossians Christians. What a wonderful testimony to these saints, and what a challenge to all who are saved by the blood of the Lamb. As an outpouring of their trust in Christ Jesus as Saviour this little band of believers demonstrated a deep love for all the saints of Christ and how this rejoiced the heart of the apostle Paul, who kept this group of Christian believers continually in his prayers. 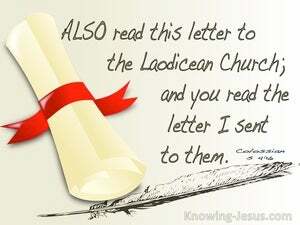 It was by God's will that Paul was chosen to be an apostle of the Lord Jesus. 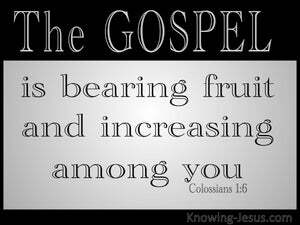 We read of various co-workers in the gospel, and fellow bond-servants of Christ, who worked alongside him. 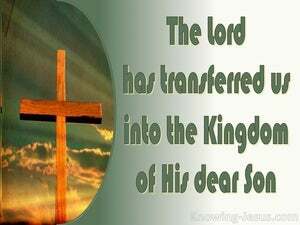 Some accompanied him on his various missionary journeys, while others carried messages, or delivered epistles to different congregations of believers, during his various imprisonments. At the start of his epistles to the various churches, we discover Paul giving greetings to the people and thanksgiving to the Lord. Very often in his salutation at the start of his letters we find Paul giving thanks and praise to God, for the faith of the saints to whom he was writing. And frequently we find Paul interceding for the saints and asking God for their continual well-being and spiritual growth. 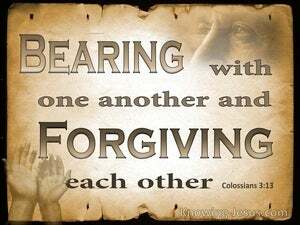 Paul opens his epistle to the Colossians expressing his profound joy and grateful thanks for them all, because of their sincere faith in the gospel of Christ, the deep love which they showed for one another and because of the obvious future hope they possessed - which is laid up for us in heaven. When Paul prays for his brothers and sisters in Christ, he does not focus on the day-to-day material needs of the saints nor on other physical matters and necessities of life. 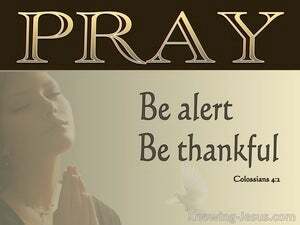 Paul prays for spiritual blessings; godly wisdom; practical obedience; moral excellence and a Christ-like character. 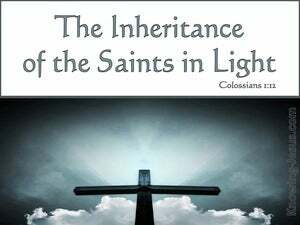 As members of a fallen race we were unfit for the glories of heaven.. for sin had disqualified us and rendered us dead in our trespasses and separated forever from our Creator - but through the blood of Christ we have been qualified to share in the inheritance of the saints - by faith. 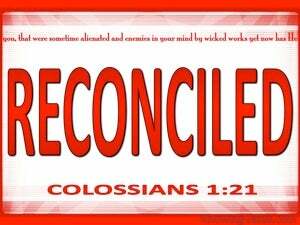 Man is a sinner and only a Saviour is the answer to man's sin problem. 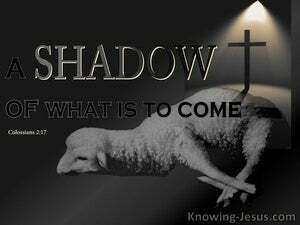 Fallen man seeks answers in many different places, but God has purposed that there is one Deliver Who can release us from the domain of darkness - there is only one Saviour that can rescue us from the terrible eternal consequences of our fallen state - the 'God-Man' Christ Jesus. 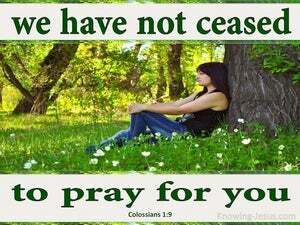 Paul's prayers were filled with thanksgiving for his Christian brothers and sisters at Colossae, because of their faith in Christ, their love in spirit and truth for one another.. and their heavenly hope in their eternal inheritance - a heritage in Christ's kingdom of light, which is kept for us.. in heaven. 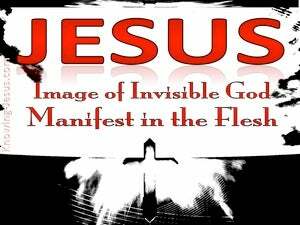 The Lord Jesus in His humanity is the visible revelation of the invisible God. 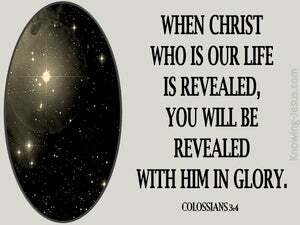 This is a great mystery but it is a truth that has been given to us from the Creator of the universe. 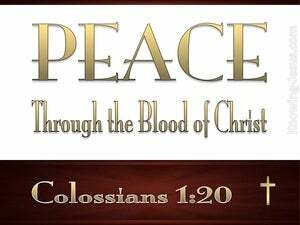 The only way for sinful humanity to be reconciled to a holy God is through the shed blood of the eternal Son of God, Who died to pay the price for our sins so that we might be covered with His righteousness and reconciled back to the Father. Christ is omnipotent God, the Creator of the universe, the second Person of the Trinity, the eternal Son of the living God.. Who was born into the human race to become the perfect Son of Man and our kinsman Redeemer - so that He could become the sacrifice for sin and the Saviour of all who would trust in His name - for by Him and through Him and for Him all things were created. 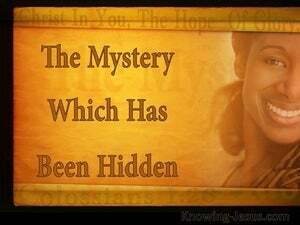 The irreducible deity and eternality of Christ is often a stumbling block to the limited minds of men, which gives rise to a plethora of false teachings and gnostic gospels, which results in esoteric, mystical confusion about the Person and Work of Jesus Christ - the eternal Son of God and perfect Son of Man. 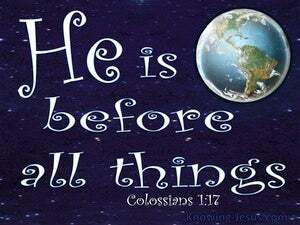 Christ is the Sovereign Creator, through Whom all things were made and by Whom all things in heaven and on earth, (both visible and invisible), hold together. 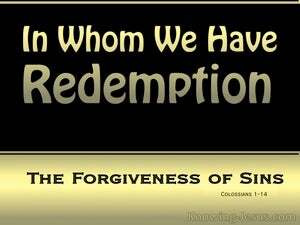 He is the uncreated God, Who willingly took upon Himself human flesh.. so that through His shed blood we might receive redemption of our bodies - the forgiveness of sins. 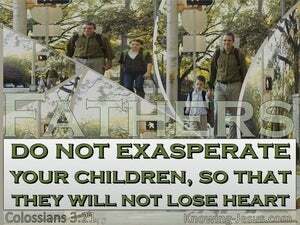 The simple gospel truth is easy for a child to understand but for the rationally thinking man with his analytical mind, the simple gospel truth, is the most complicated and abnormal concept to comprehend, simply because it does not fall within the bounds of ‘normal’ human reasoning. 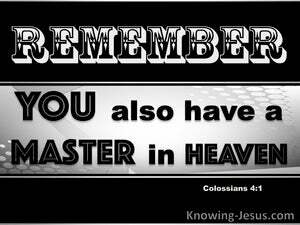 But God’s boundless and eternal mind is above the restricted limitations of man. 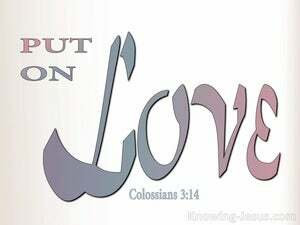 What an astonishing truth is wrapped up in this simple verse. Just as Christ was the One through Whom all things were made, by His mighty power, in the original creation, which was ruined through sin - so also that same Christ Jesus is the One through Whom the new creation is formed and made - and through that same Lord Jesus Christ, God is going to make peace with everything in heaven and on earth, by means of Christ's blood on the cross. The passage that precede this verse reaches to the heights of the glories of God and paints a stunning picture of who we are in Christ. 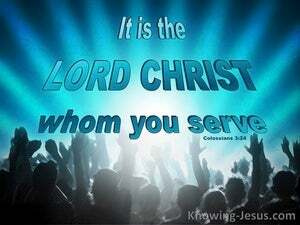 We are presented with a feast of all the privileges that are ours in Christ Jesus, Who has delivered us out of the power of darkness and translated us into the kingdom of His dear Son - by grace through faith. 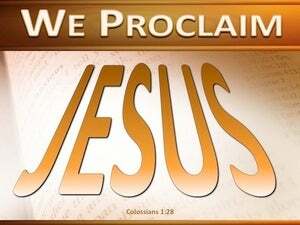 After a brief reminder that they were once alienated from their Creator, bitter enemies with God in thought, word and deed and slaves to every kind of evil, the Colossian Christians were reminded that by His immeasurable grace, God had planned for their reconciliation back to Himself, through the matchless death, burial and resurrection of His dearly beloved Son, our Lord and Saviour - Jesus Christ. 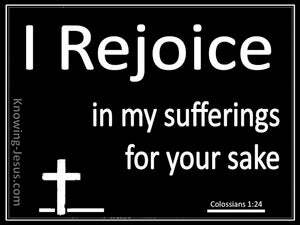 Paul is able to rejoice in his sufferings because he was counted worthy to suffer for the sake of Jesus Christ. 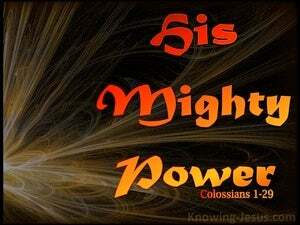 Like Paul we too can know Christ and the power of His resurrection. 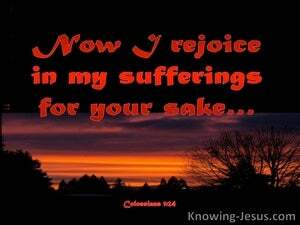 We too can fellowship in His suffering - and fill up what is lacking in Christ's afflictions. Suffering is part of our passage through life. Suffering, pain and death is the stark reality of living in a sinful world and there is no one exempt from suffering, for we live in a fallen world, that is lying in the evil one. 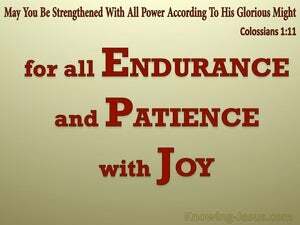 Paul was surrounded by a host of enemies both physical and spiritual, and experienced the most acute hardships and persecutions during his God-appointed ministry. 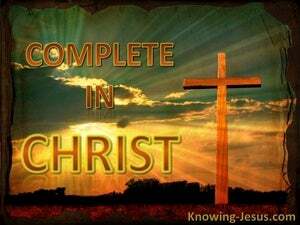 He had been chosen to be the missionary to the gentiles who were formerly alienated from God, hopelessly dead in sins and engaged in evil deeds, but by God's grace many were reconciled to Him through faith in Christ for their Salvation. 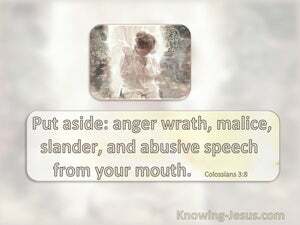 While incarcerated in prison, Paul lifted up his heart in earnest prayer for the Colossian Christians - for spiritual intelligence, for practical obedience, for moral excellence and that Christ may be crowned Lord of all in their lives - so that they might become complete in Him and attain unto spiritual maturity. 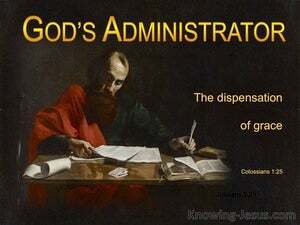 Much doctrinal truth is reflected within the prayers that Paul prayed for the family of God, and much instruction and wise counsel on how to live the Christian life in a manner that is honouring to the Lord is similarly couched within the content of Paul's intercessions for the saints of God. 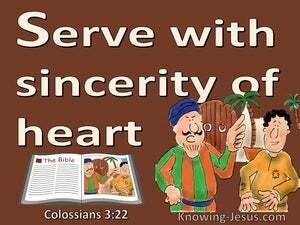 Paul had never met the Christians at Colossai and yet he had a personal interest in their spiritual maturity. 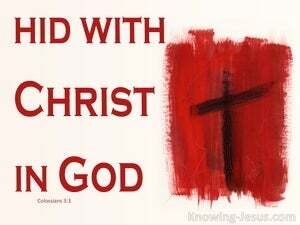 Paul offered many prayers to the Lord on their behalf and wrote an instructive letter to encourage their hearts, develop their spiritual understanding, guide them in the truth of the gospel of Christ, warn them of the dangers of false teachers and unite them together in love. 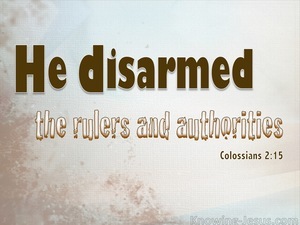 We live in perilous times, when false teachings abound and Paul's message to the Colossian Christians reminded them that Christ is sufficient - even when we find ourselves battling unbiblical doctrine and the God-hating, Christ-rejecting world-view of the day. 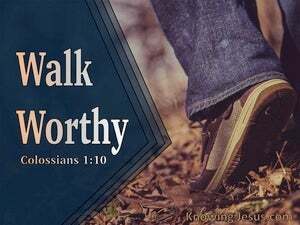 We are called to walk worthy of our Lord and to be fruitful in our Christian life - but this can only be achieved as we abide in Him, rest in Him, trust our lives into His safe-keeping and walk in spirit and truth. 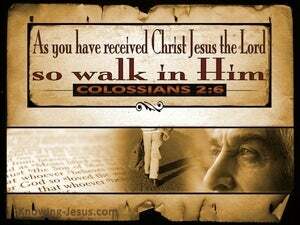 It is only as we willingly choose to be submitted to the leading and guidance of the Holy Spirit in our lives that we can truly walk worthy of our Lord, in spirit and in truth - it is only as we received from Him can we can walk in Him. 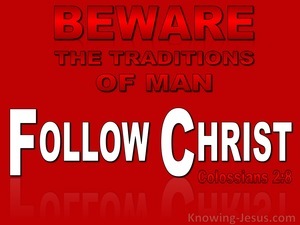 The syncretism and traditions of men do not have Christ as the focal point and Paul was warning the Colossian believers not adopted these basic, world philosophies of men or their legalistic laws, because they cloud the true concept of Christ and distort the biblical truth of the Lord Jesus in the mind of the believer - they rob the Christian of a proper understanding of the wonderful sufficiency and amazing adequacy of Christ in the life of ALL believers. 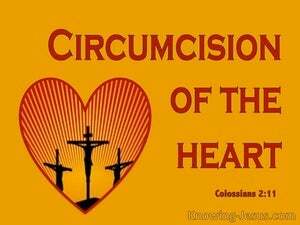 Circumcision, like the sacrificing of animals, was given by God to Abraham and Israel as a sign between the Lord and His chosen people that they were to be a family that were separated from the world – a race that was sanctified unto the Lord – a peculiar people - an adopted son of God who trusted the Almighty Yahweh and not the world systems. 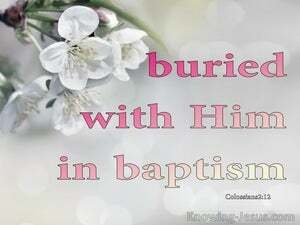 It is very important to get a biblical understanding of the word: 'baptism' as recorded in the Bible. Some baptisms are wet, such as John's 'baptism of repentance'. 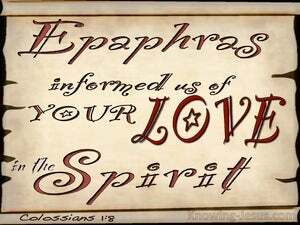 Other baptisms are dry, such as the baptism of the Spirit, when we are placed into Christ's mystic body by the Holy Spirit, at salvation. 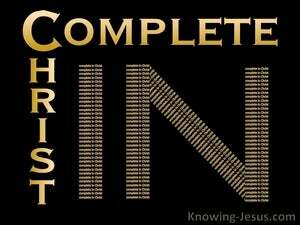 The death and resurrection of Christ was a complete and final victory over sin.. for Christ not only died FOR our sins, so that we might be reconciled to God and saved from the consequences of sin, which is eternal separation from God, but He also died UNTO sin so that His life would become our life and the strangle-hold that sin held over us would be broken forever. 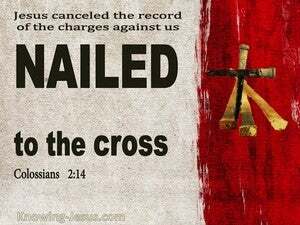 The crucifixion of our Lord Jesus Christ freed us from the righteous demands of the law by nailing them to the cross, and permanently erasing the un-payable certificate of debt that we owe, so that all who believe in Him are no longer under law but under grace. 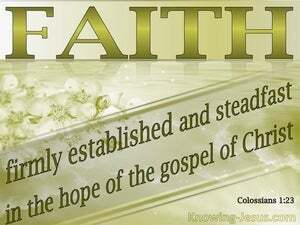 Paul often lays the foundation and fundamentals of faith early in his writings. He then identifies anything that has caused his readers to stray from the truth, or has diverted their attention away from Christ. Finally, he explains how these truths should be applied to our individual, everyday lives. 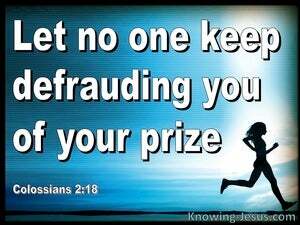 There are many subtle ways that the enemy of our soul is able to defraud us of the heavenly prize that awaits the children of God. 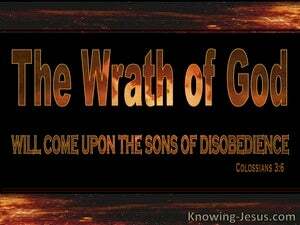 There are those that seek to captivate our minds through men-inspired philosophies and other empty deceptions – all of which emanate from the proud traditions of man, and which are according to the elementary principles of this fallen world’s system, rather than from Christ. 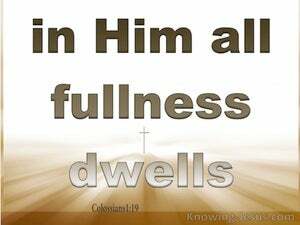 This verse of Scripture is part of a passage that denounces a range of heretical teachings and lays out the criteria for living a high and holy life in Christ Jesus. It seeks to prevent these believers from becoming captive to false teachings or duped by deceptive philosophies, while encouraging them to develop an inner, spiritual and sacrificial life in Him. Every member of the human race is connected to Adam by birth. All are imputed with a sin nature and the wages of sin is death. As members of the first, fallen creation we are all irrevocably identified with Adam and the eternal consequences of his rebellious fall. There are many appealing philosophies; human commands; Jewish procedures and aesthetic practices that can deceive a believer into wrong thinking and cause them to adopt unbiblical ways, particularly with regard to food and drink; customs like circumcision; a fascination with angels; visions and feelings or the requirement to adopt sabbath-day rules or the mandatory participation in feast days. Paul is eager to make a clear distinction between the sufficiency we have in Christ and the empty futility of worldly philosophies and the deception of human wisdom. 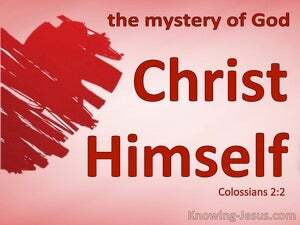 He wants to instil in our heart the perils of legalism; mysticism; asceticism and every other kind of man-made rite, religious ritual or self-imposed mortification of the flesh. 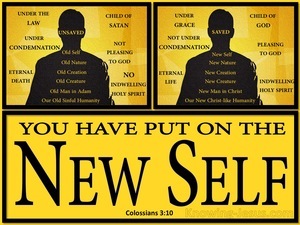 There is a reason that Paul is calling those that are born of the Spirit to keep their hearts and minds focussed on heavenly things and not on earthy pursuits and interests – it is because we have been raised up into a new life in Christ – because we are Christ’s spiritual seed –because we have become a brand new creation - because we have exchanged our former earthly residency for a glorious new citizenship, which is reserved for us in heaven. This beautiful verse is in a section of scripture where Paul deals with one of the basic aspects of the Christian life - believers are in union with Christ – we are one with Him. 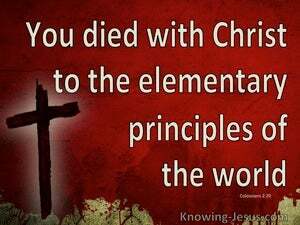 Christ died for our sins as our substitute; (substitution) but He also died unto sin, by breaking the power of sin over us: (identification). 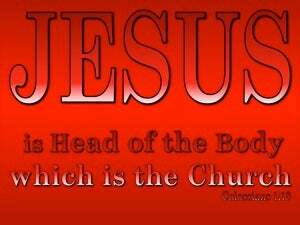 When we trusted Jesus as Saviour we were placed in HIM. 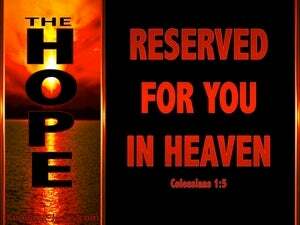 The moment we were saved we were baptised into the body of Christ, by the power of the Holy Spirit. IS NOT THIS GLORIOUS? 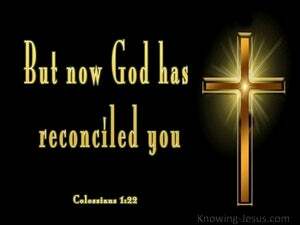 When we were saved we were given a new life - the new life in Christ. Old things were passed away, behold all things have become new. 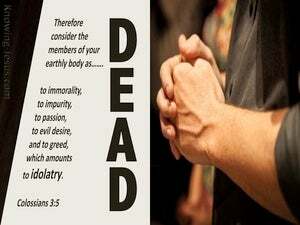 Our old sin nature was replaced by a new Christ-like nature.. and Paul tells us in many places to reckon ourselves dead to the old sin nature and alive to the new life in Christ. 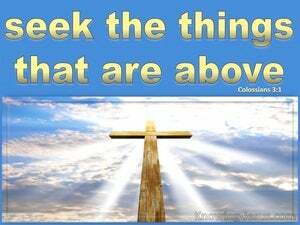 Because we are children of God we are to look to Jesus, Who is the Author and Finisher of our faith. He rose from the dead and broke the power of sin and death in the lives of all who place their trust in Him. 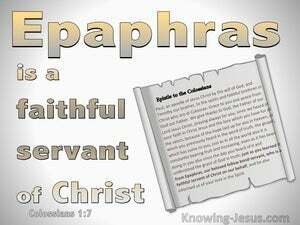 All of Paul's epistles are laid out in a structured way. 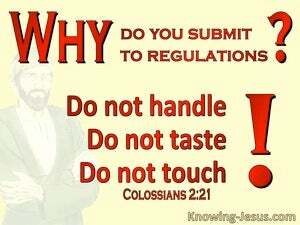 He generally reminds us of our position and privileges in Christ and then continues by instructing us on how to live godly lives, and what worldly actions and attitudes need to be avoided. 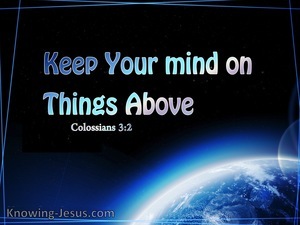 Earlier we are reminded that we have been raised up with Christ, Who is seated in heavenly places at the right hand of the Father, and we should set our minds on things above and not on earthly matters. 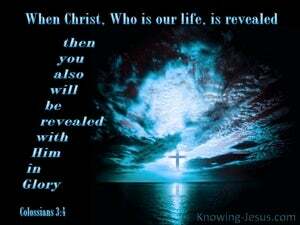 God is truth and the Author of truth and He delights in truthfulness. 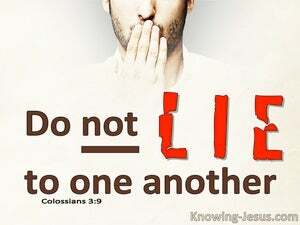 Scripture tells us that the Lord hates liars, and those that deceive others with a lying tongue. 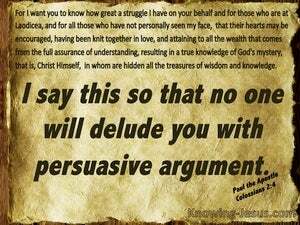 Paul instructs us not to lie to one another, because as believers, we have laid aside the old Adamic nature, and the evil practices that accompany our former - pre-salvation life. 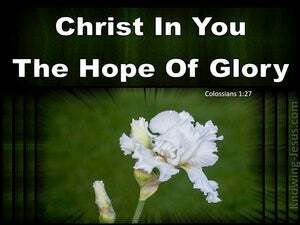 The moment that we are born again we are made a new creation in Christ. 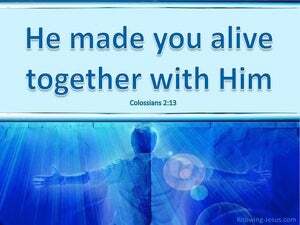 The second we are saved we are given a new nature:- the resurrected life of Christ within. 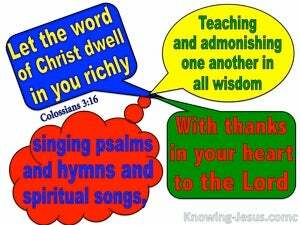 But also the Holy Spirit of God comes to indwell our body.. to teach and train us; to guard and guide us, and He also disciplines, chastens and corrects our new life in Christ. 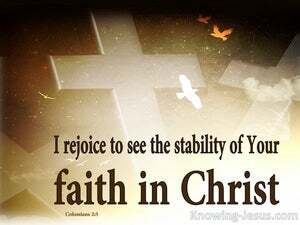 By faith in Christ, we have been renewed. We have been made a new creation. 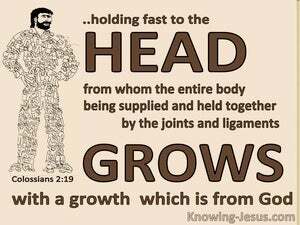 Indeed, the differences between the old creation in Adam and the new creation in Christ is astounding. The former creation is dead in trespasses and sin. The latter creation is born-again of the Spirit of God. What wonderful truths are shared about the believers position in Christ and our special relationship to our heavenly Father. 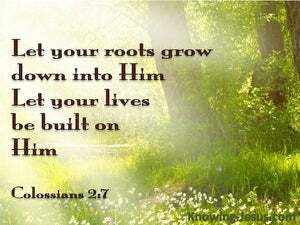 We discover that at rebirth we not only died with Christ.. but we are raised up into newness of life in Him - and our new-life-in-Christ - our born-again nature, is positioned in Him. Paul presents us with some important doctrinal issues on the superiority and pre-eminence of Christ, and the sufficient strength He gives to each one of us, day by day. 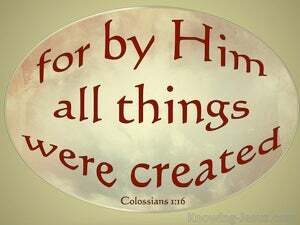 What an amazing privilege it is to be a new creation in Christ.. forgiven of our sin, loved by the Lord, accepted in the Beloved, heirs of God and joint-heirs with the Lord Jesus.. and Paul lays out in no uncertain terms, our duty and delight towards the preeminent Christ - Who is our life. 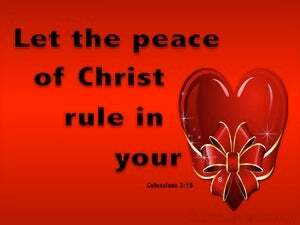 Peace WITH God is our permanent possession when we believe on the Lord Jesus Christ for salvation, but the peace OF God is conditional upon a believer being in a relationship with the Lord Jesus - as we abide in Christ, trust His Word, depend on His guidance, die to self and live for Him. The Lord Jesus was meek and lowly, full of compassion and of great mercy – and the gracious words that fell from His lips were life and health and healing and we are exhorted to let His Word dwell in us richly, both His spoken words and His written word, for they produce in us abundance of life and the spirit of true wisdom. 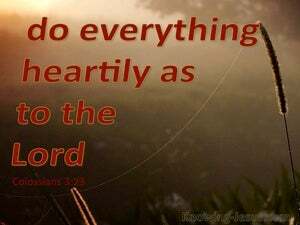 This little verse sums up in a nutshell what the Christians life should look like and how the born-again believer should behave moment by moment.. in word and in deed - in mind and in motive. 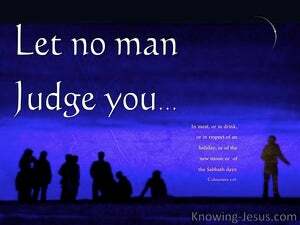 There is no excuse for the born-again child of God to argue that they do not know the privileges that are ours in Christ. 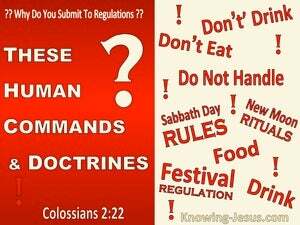 As Christians, we should know the God-given rules for holy living, which are written for our learning in the Word of God. We should know the truth, and we should be applying these biblical principles for godly living in our every-day lives - because they are very clearly laid-out for our learning, in all the New Testament epistles. Biblically based, practical Christianity and our fundamental relationships, at home, in Church fellowships and in the wider community is an important theme Paul addresses in this section. 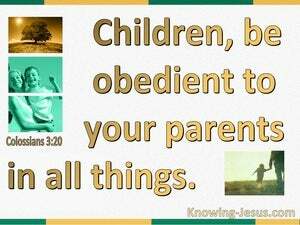 He starts by identifying certain general standards of godly behaviour, for all Christians, before addressing roles and responsibilities that specifically relate to married couples; children and parents.. and servants and their masters. There are many social issues in the world today, that the church rightly approves or justly condemns. Slavery is certainly a practice that is condemned.. and especially enforced or unjust slavery. 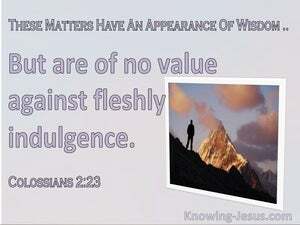 Having set out all the many advantages of being in Christ in the first two chapters of Colossians, and laying before us the glories of God’s grace, and the heavenly privileges, of which we are all beneficiaries, Paul turns his attention to practical application in the final two chapters of his epistle. 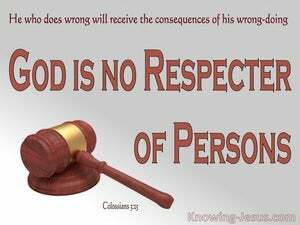 The Lord is no respecter of persons. There is no one that is excluded from His gracious offer of salvation, by grace through faith in Jesus Christ.. and there are none that are given extra-special treatment based on their status, skills, colour, parentage, gender, intellectual capacity, political leanings, business acumen or charismatic personality. Paul equips the saints to recognise false teaching and doctrines of demons by teaching the truth of the Gospel of God to the saints. 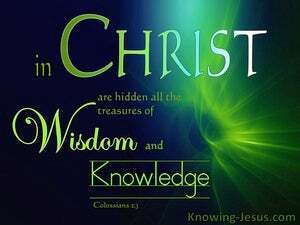 He teaches of the exaltation and perfection of Christ, the deity and the sufficiency of Christ and the wisdom and glory of Christ. He teaches of our reconciliation by Christ, and our membership in the Body of Christ - and He details the importance of a believe's prayer life and testimony for the Lord. 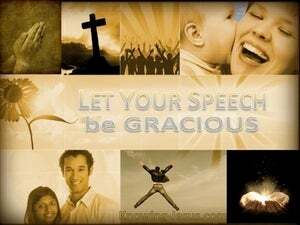 It was the Lord Jesus about Whom it was said, no man ever spoke like this man and it was the Lord Jesus who spoke in spirit and truth. 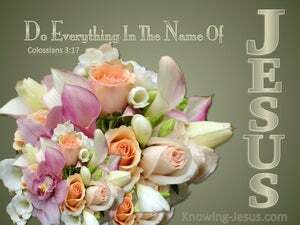 Jesus only said what He heard the Father say and He only did as the Spirit of God instructed Him. 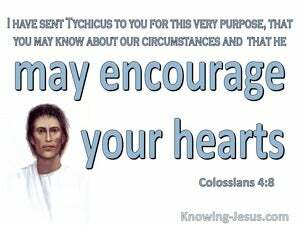 The letter Paul wrote to the Colossians suggests that the believers there, as well as those in Laodicea, had never met Paul in person, although he prayed regularly for them and wrote letters to them to give them personal encouragement and instruction in Christian living.